In my last post I listed a few squirrel proof bird feeders that are pretty good at keeping the squirrels at bay. 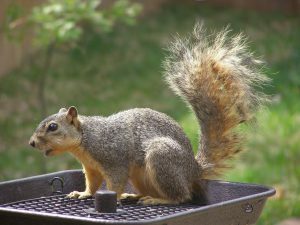 One person commented that “the squirrels need to eat too!” But many people, including me, do not appreciate squirrels at their bird feeders because they hog the feeder,keeping the birds from getting any seed. 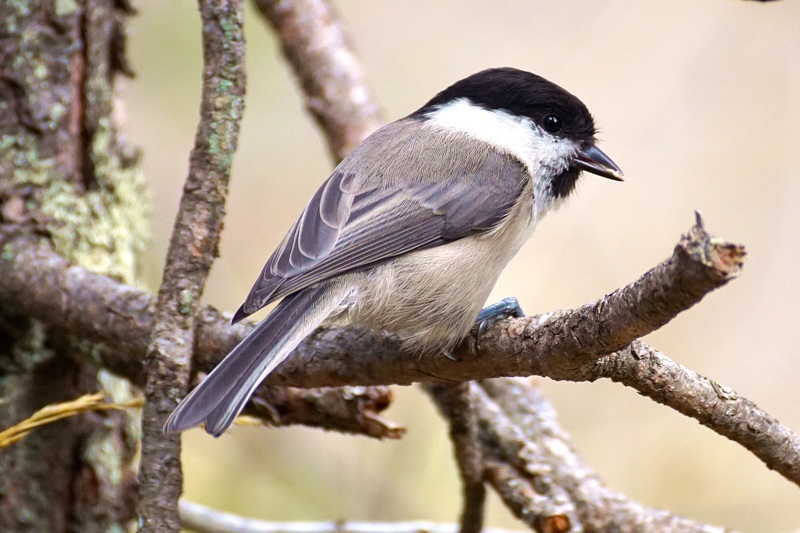 Plus they are pretty good at cleaning out a bird seed tray fairly quickly and if they are a constant visitor it can get very frustrating. I agree that squirrels need to eat. However I also know that squirrels gather food in the fall such as nuts, seeds, acorns, and berries and carry them in their mouth back to their nest where they store it. They also may bury food in the ground in various places around the neighborhood and then later with their sense of smell can unearth it when they need it. Extreme weather or long winters may make it more difficult for them. In that case, feeding them may be something to think about. You may be in disagreement with me and feel like you want to feed them any time. There is nothing wrong with feeding wild squirrels especially in the winter. In fact, if you provide a separate feeding station just for squirrels, you may be able to dissuade them from going to the bird feeders if you have them. What To Feed The Squirrels? You may be surprised but squirrels do not just eat nuts. Squirrels also eat seeds, tree flowers and tree buds from butternut, cedar, dogwood, elm, hackberry, hemlock, hickory, maple, mulberry, pine and spruce trees. They also snack on berries, mushrooms, and fungi from time to time. Most people choose to feed the squirrels peanuts, corn, or seed. These are a good backup food if you don’t have anything else but the best food for a squirrel’s overall health is shelled nuts such as peanuts, walnuts, hickory nuts, white oak acorns, and beechnuts. Some of these can be found in the woods if you are not able to find them at the store. This feeder is made of indestructible solid steel and holds a large bag of shelled peanuts. It has a perch for squirrels to sit and eat and is easy to maintain and clean. The house and base is made of recycled plastic with a jar container for the food. It can be mounted on a pole. This feeder provides shelter for squirrels too. Some birds are able to get to it as long as you don’t mind that. This wire feeder can be used for both squirrels and birds such as Blue jays and woodpeckers. Dimensions are 5 x 8.5 x 9.5 inches and is made of hard plastic. As mentioned earlier, corn is a good food source for squirrels as long as it is added with other foods such as shelled nuts. Made out of PVC and includes a 20 inch wire for hanging. Dispenses nuts automatically! The steel bar prevents walnuts from rolling out but allows the squirrels to grab the nuts with ease. This feeder measures about 11″ long – Opening is 3″ and holds about 1.5 pounds of walnuts. – Holds about 1.5 pound of walnuts. Squirrels can find food buried beneath a foot of snow. They are able to do this by digging a tunnel under the snow following the scent of the food. Squirrel’s front teeth never stop growing. They must gnaw in order to keep the right length. Squirrels can lose up to 25% of their stored food. This is because of fellow squirrels and birds stealing it for their own dinner. To throw off the thieves who like to steal their food, squirrels fake them out by digging a hole and covering it up without placing anything in it. If a squirrel feels threatened it runs in an erratic pattern to escape their predators. Squirrels don’t always dig up all of the nuts that they have stored which causes new trees to grow. Baby squirrels are only one inch long. There are over 265 species of squirrels in the world. Squirrels communicate with each other through various vocalizations and scent marking. They also use their tails as a signalling device, twitching it when uneasy to alert other squirrels of potential danger. Squirrels are cute little mammals that many people enjoy feeding in their backyards just like the birds. If you are going to feed both, it is a good idea to have a separate feeder/s for each. 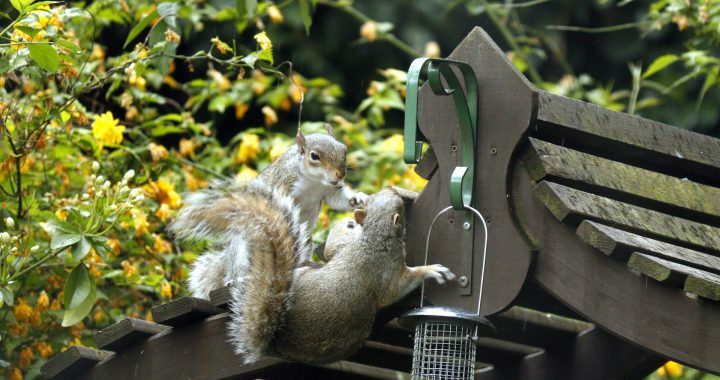 By having a separate squirrel feeder it will deter the squirrels from hogging the bird feeder and cleaning it out. Just make sure that you have some type of squirrel baffle on your bird feeder for insurance. Do you feed the squirrels in your backyard? I would love to hear your thoughts and experiences. Feel free to leave a comment below. Posted in Backyard Wildlife, In The Garden, Wild Bird Food.